If you would like to see previews of our newest products, get amazing discounts, and talk to us directly about our next designs, check out our Patreon page at https://www.patreon.com/printapot . Welcome to our Print A Pot store! 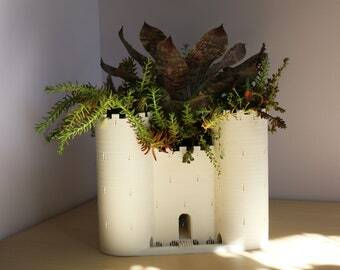 We make 3D-printed planters and pots for gifts and home decor. Our selection ranges from fun and cutesy to modern and sleek. We are developing and designing new products every week. If you would like us to print you a custom pot or a personalized pot, please send us a message! Super cute and nicely made pineapple!!! 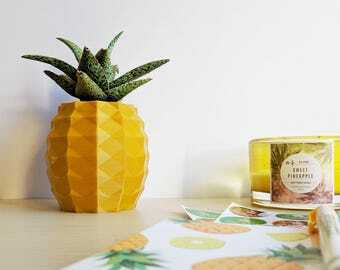 Very healthy little plant included makes the pineapple perfect!!! I love them!!! Valentine's day sale is on now for 25% off your order of $15 or more! Get this and other products in our store for 25% off this month! We have 2 printers in our 3D print studio. This is our Ultimaker 3 Extended, that can print with 2 colors. Our pots are lightweight, unlike terracotta, ceramic and clay pots. We've been gardening and growing plants for years. We compost our plant waste and use other eco-friendly practices. We provide rainwater and indirect sunlight for all our plants. We print unique pots for you. 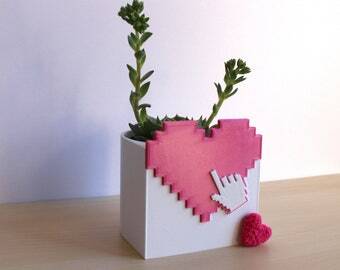 Combining technology, function, and our love for plants, Print A Pot is a small mom-and-pop / husband-and-wife business designing and creating decorative and fun pots. Our pots can be used in a variety of indoor settings by themselves or with plants to add beauty to any space in your home or office. We are also currently designing outdoor pots for patios, gardens, and small trees. We strive to be as environmentally conscious as possible. Most of our packaging materials are recyclable and/or reusable, and we reuse shipping boxes when possible. All of our printing materials are made from a bio-derived PLA that is 100% biodegradable. As creators, we can customize or create something completely unique. If you would like to commission a 3D printed product, message us! We do accept custom and personalized orders! Send us a message for your request and we will do our best to accommodate. Brand new designs would take 2-3 weeks to develop, and customizing one of our available products would take about 1 week. We will have additional personalization options for some of our products in the future, like adding a name or a message to a pot. Our indoor pots and planters are intended for indoor use only. Pots with drainage holes should be placed over a drainage tray. For air plants, ensure they receive enough indirect sunlight or close exposure to fluorescent lighting. For watering, use rainwater, lake/pond water, or tap water that's been left out (to dissipate the chlorine). Soak in water for 10 minutes once or twice a week, and mist heavily when leaves feel dry or look silver. Allow air plants to dry in a well-ventilated place after soaking. For succulents, water thoroughly once every 1 or 2 weeks or whenever soil is completely dry. Provide indirect sunlight, or slowly harden succulent to get used to direct sunlight. We have several products available for wholesale. Send us a message with what you like and what quantities you're looking to get, and we will collaborate with you on any bulk orders! When you place your order, we add your product to our printing queue. Given current order volume and our printer capabilities, we do try to print your product as soon as possible. We also inspect each product for quality control, and will reprint if needed. If you are not satisfied with your product, please contact us for a return or exchange. We try to match the colors shown in our photos with each of our prints. Due to different 3D printers, different brands of filament, and environmental factors (such as temperature and humidity), there may be some fluctuations in color and/or finish (matte vs shiny) between printed products. If you need your order by a specific deadline within the US, please message us with what you would like to order, the colors you want, and your zip code to ensure we can print and ship in time for your deadline. We will review your order and if we can meet your deadline, we will provide a custom listing with expedited shipping costs. We cannot guarantee international delivery by specific dates. For some products we offer Free Domestic Shipping. For any packages under 16 oz, we will send it with USPS First Class Shipping even if Etsy prefills the shipping option as Priority Mail. If you do need Priority Mail shipping with your package, please contact us. For larger pots that are over 16 oz, we will send it as Free Priority Mail. Please let us know if your order is being sent as a gift to someone. We include an order receipt in all of our packages, and we will send a gift receipt instead if we know your order is a gift! If you would like us to include a gift message as well, please let us know. We guarantee that we ship out only healthy plants. If your plant is not doing well, contact us immediately for advice. When you receive your air plant(s), soak immediately in room temperature chlorine-free water for 10-15 minutes. You can soak for even longer if it took a long trip during shipping. If your air plant arrives dead, please take photos and send the photos to us. We can replace air plants if you contact us within 7 days of your package arriving. For succulents or cacti, we try to reduce as much damage as possible during shipping but some damage may be unavoidable. If your plant arrives dead, take photos and send the photos to us within 7 days of your package arriving. We will evaluate and offer a resolution. I love PrintAPot! Where can I find out more? We now have a Patreon page where we have a number of benefits, including 1 year anniversary gifts, exclusive previews to new designs, and a whole lot more. Come visit us.